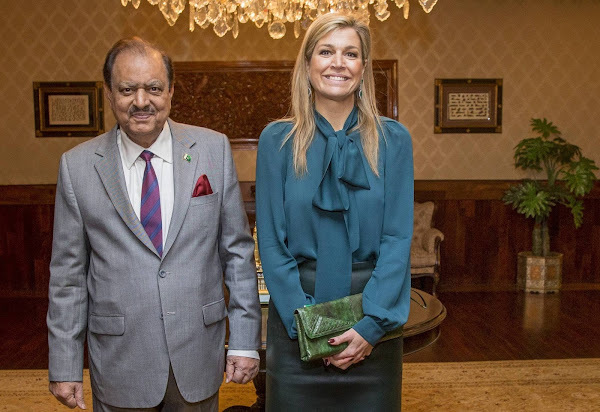 Dutch Queen Maxima attend an meeting with the President of Pakistan Mamnoon Hussain at the Residential Palace on February 11, 2016 in İslamabad, Pakistan. Queen Maxima is in Pakistan as United Nations Secretary-General’s Special Advocate for Inclusive Finance for Development to promote and support financial services in development countries. Queen Maxima of The Netherlands leaves the Serena Hotel for her flight back to The Netherlands after her three day visit to Pakistan as United Nations Secretary-General’s Special Advocate for Inclusive Finance for Development on February 11, 2016. Oh my goodness, green leather skirt, green stockings ?? should never talk about MM and her stockings again. The big bow on the shirt ?? Queen Maxima actually made a fashionable choice for example is the length of the skirt is hers, but the colors and the material are not hers. Just Princess Madeleine would have looked georgues with this outfit. I´m not a fan of Madeleine of Sweden at all. Queen Letzia would have looked old-fashioned like Queen Maxima. you would know, that QM is really looking fresh and absolutley georgues. Have a look, come on. Horrible outfit and shoes, terrible hair. Not a winner day for Maxima. He doesn't have an enterage of stylist so he's dressed fine. We are not commenting here Maxima´s education or intelligence, just the clothes she wears in these pictures. She is not wearing her diplomas. Maxima can look just knock out stylish but this was not one of those days. The President is the one that is dressed appropriately no need to comment. oh, this skirt and stockings are ugly. the blouse is old fashion, Mathilde has the same in pink. She is not the best dressed but she has a personal style and a lot of imagination -I want always to see what she will wear! I think she looks great, especially the bow on the blouse. But i doubt it very much that it was her intention to correspondent with the Pakistani flag. there is no end to her creativity and style. Respectfully I wouldn't be surprised if her colors were to give a sign of respect for their flag. She always looks wonderful. Posters above might, respectfully, expand their perspectives and imaginations and tastes to get on the stylish wavelength of what the Queen wears, it suits her beautifully. Beauty is in the eye of the beholder and she is dressing for the honor of her location. That green outfit is the WORST! Oh Maxima please burn it all! What was she thinking. It is just so so bad. The Pakistani flag is green and white. Chose one green! @Morgane, i cannot understand why you call that blouse old fashion, i think you do not follow fashion because that kind of blouses are highly fashionable at the moment. I like the blouse and the skirt, both are beautiful, not a fan of the stockings/tights and and I think black shoes may have looked nicer, but I can't really say, because I think the stockings/tights have spoiled what would have been a lovely outfit. I agree with most of the comments. Her look is bad in so many ways...from head to toe. @Iris I am becoming your friend!I agree with all your comments on this site. Le vert est la couleur du prophète Mahomet,un grand symbole pour les musulmans.La reine Maxima a sorti tout ce qu'elle avait de vert ,ce n'est peut être pas réussi mais c'est un hommage envers ses hotes . Well her outfit is not bad .Maxima always looks confident and smiling big no mater if she has her hair done or not wearing make up .She is really amazing.